If you’re a big sports fan, then you know all about the almighty power — and sometimes unforgiving will — of Mr. Momentum. In the blink of an eye, the favor can switch from one team to another, and for that period of time, nothing can stop them. Real estate marketing is a contact sport, so we can harness what we know about Mr. Momentum and apply it here, too. Marketing momentum is much easier to explain than momentum in sports. We understand how and why it gets started, and it can easily be used to build on the work you’ve already done. Leveraging momentum marketing is simple, it’s inexpensive, and it will produce high returns if you continue to nudge your strategy forward using the momentum started by the new listing you just secured in the neighborhood. There will, of course, be markets where this approach works better than in other markets. This year started off with low interest rates, and you should have no shortage of opportunities to take advantage of activity around your listing. Step 1: Create a neighborhood-exclusive open-house flier. I’m sure many of you are already doing this; it’s one of the best excuses you’ll ever have for meeting the neighbors. Marketing a neighborhood-exclusive open house is simple, but the messaging must be precise to accomplish your ultimate goal. Depending on your price range, your approach can be as quaint or as fancy as you like. Simply knock on the doors of the 100 closest homes and personally invite the residents for snacks, drinks and exclusive access to your new listing before it is open to the public. For under $100, and a quick trip to Costco or your local bulk-goods store, you can pick up a couple bottles of $10 white or red wine, plus apple cider for the kids. (Putting the wine in decanters will allow you to hide the bottles and make the selection seem more upscale.) A nice cheese and meat platter, plus vegetables and crackers with various dips, will round out this red-carpet event without breaking the bank. Oh yeah: Don’t forget to throw a batch of chocolate chip cookies in the oven for added excellence and aroma. An ideal setup for an event like this is a Friday evening for no more than two hours — maybe 5 to 7 p.m. You want to create some scarcity to drive value home. You will find that contact with neighbors after the event will elicit comments like, “I got home late and couldn’t make it.” That is precisely what you’re going for — a door-opener to a conversation. 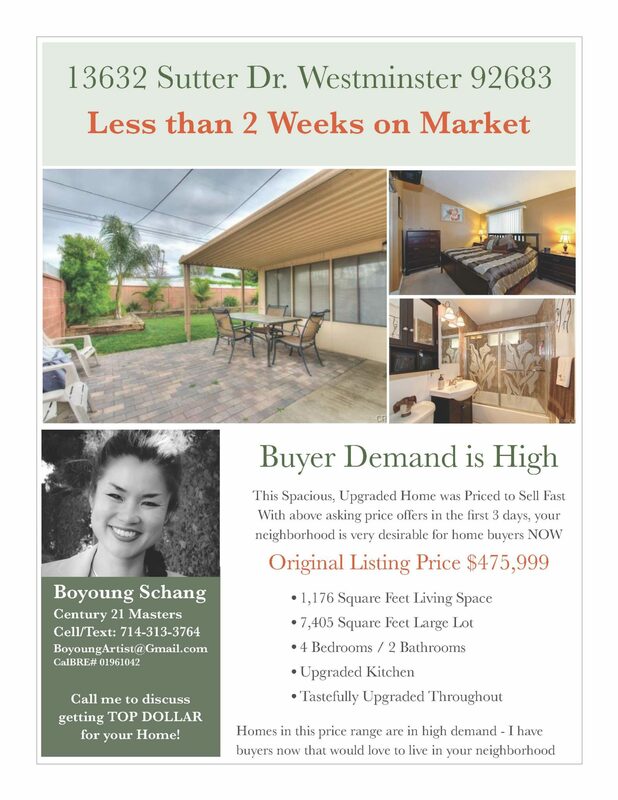 Step 2: Create a “buyer demand is higher” flier. Leveraging the time it takes you to receive a full-price or even higher offer, use this opportunity to inform the neighbors again about the great buyer demand in their neighborhood. The home does not necessarily need to be in escrow at this point; you only need to be confident that your listing is likely to sell at or above asking price. With the market as hot as it is this first quarter of 2015, an ideal timeline is two weeks from the listing date. The headline for this flier is something along the lines of “Less than two weeks on the market!” You’re not committing to exact timelines or specific prices here; that’s not the point. The purpose of this step is to build awareness with the neighbors that their neighborhood is in high demand and that buyers are coming out in droves. The message of this contact is that your offer was accepted so quickly that you now have a list of buyers interested in homes in this price range, in this neighborhood … and it might be the right opportunity if you’ve been thinking about moving. Step 3: Create a just-sold flier. Just-sold postcards are fine, but I think you’re missing out on the momentum you’ve established by communicating closely with the 100-home farm you’ve carved out around your listing. You’ve already personally invited them to an exclusive sneak peek at their neighbor’s listed home, and you’ve reached out again only a couple of short weeks later to let them know that there is enormous demand in their neighborhood. This time, you’re bragging — not only about the time it took you to sell the home, but also about the list price you were able to obtain for the home. Under somewhat normal circumstances, this last contact with your group of 100 neighbors should happen within 45 to 60 days from when you took your listing. There is not a single marketing piece here that says, “Look at me, I sell homes!” You are creating an educational campaign aimed at informing the neighborhood about local home values and the high demand for top dollar that’s possible if the timing is right. Your value as a Realtor is exhibited by your consistency, your message and your opportunity to potentially personally speak to the neighbors up to three times over a 30- to 60-day period about a topic that is relevant to them. And if a neighbor shows up at your neighborhood exclusive, or a subsequent open house, then you’ve added yet another contact. It goes without saying that every step of this strategy includes building trust and displaying your work ethic when one of these 100 prospects asks you what his or her home is worth in the local market. You don’t have to spend a ton of money on fliers; I use a modified version of an Apple Pages template that is free and comes as part of the standard templates within Pages. It has a big, bold headline and vibrant colors to catch the attention of the reader. It also features one large and two smaller images to highlight the best pictures of the property. I use the same template for all three fliers and just change some of the text to deliver each message. If your word processing program has a free real estate template that you like, spend your money on the paper. I use a Hammermill, 20-pound paper with a brightness rating of 100. This quality of paper will cost you less than $20 for a ream of 500 sheets. If you use high-quality pictures and print these fliers on a color laser printer, the paper will enhance the photos, and your fliers will look like they were professionally printed. Scott Schang is a branch manager at Broadview Mortgage in Long Beach, California.